As social media platforms are adopted by increasing numbers of consumers, discussion about the Super Bowl has moved from living room parties to Twitter and Facebook. To help marketers understand this year’s trends, Salesforce used their Social Studio product to gather stats on which Super Bowl ads got the most hashtag attention on Twitter and Instagram. It’s useful data — you can read the top images shared, most talked about ads, etc. But the report doesn’t say anything about why the ads were the most effective, or which conclusions marketing decision makers should take away about which strategies will make their marketing campaigns succeed. That’s what we’re going to cover here today. We’ll look at which elements made these campaigns successful. Then, we’ll explain what the conclusions are for marketers and advertisers, and how to utilize the same strategies to drive revenue for your company. Avocados From Mexico, the sponsor for this ad, stands out. It’s not promoting a specific product or business, it’s representing a whole category. From their website, “Avocados From Mexico [was formed for] the purpose of coordinating the marketing activities for the Mexican Hass Avocados Importers Association…This group was tasked with growing the overall avocado market.” They report being very successful, having generated more than 2 billion media impressions in 2015 and 2016, and getting the most hashtag mentions of any Super Bowl ad this year. Guacworld (seen above) is a classic example of the ad archetype called “Extreme Consequence”. Marketers can utilize this ad format for their own purposes. Instead of talking about a benefit, ads falling in this category create a negative scenario of using or having the advertised product. According to Jacob Goldenberg, Associate Professor of Marketing for University of Jerusalem, this archetype is useful for “Avoiding cliche — and still highlighting a product’s promise.” In this case, the extreme idea is having an insane amount of avocados. As a consequence, people in the ad become obsessed with what they’ll put the avocados on, with comedic results. But ads rarely go viral because of how well-structured or creative they are. Here, humor was the key factor that led to viral sharing. Humor is a high-arousal emotion, meaning that it’s more likely to stir us to act. Anger, excitement, and awe also work to help people share content. Beyond the extreme reactions which carry the ad, it is also packed full of jokes for the ad’s target audience of 20-30 somethings. Chris Elliott, an actor best known for his work in the early 90’s, is made fun of. The Wi-Fi goes out. There are tons of little nods to get this audience to hit that share button on their phones. However, the full campaign goes beyond just the Super Bowl ad. Being the smart marketers they are, Avocados From Mexico know that they need a strategy to further persuade their category. Now that they have reached awareness, they need to capitalize on those impressions and bring people through to favorability, or even intent to purchase. They’ve found this next step in the Guacworld interactive experience. It’s a true multi-channel campaign with presence on Google and both major app stores. Targeting several platforms is an important strategy for the Super Bowl, as 73% of fans surveyed reported that they intended to use a second screen during the game. Providing additional practical value prompts people to have a more favorable brand impression, and cements that in their minds. Additionally, the call to action for “Tweet to Win Prizes” will help to generate further buzz and increase the viral factor slightly. Marketing leaders should look at this campaign as an effective example of driving additional revenue for a generic product or category. Each of the elements of this campaign we’ve reviewed is just a tactic, but taken together they become an effective conversion funnel. By hooking into their target audience’s cultural reference points, and using a creative ad strategy with good next steps, Avocados From Mexico is able to further promote their category and drive sales. If anything, that description is understated. The ad is the definition of star studded. And it appears to have struck a chord. At writing, it’s accrued more than 4 million views on Youtube, and 38k+ mentions on Twitter and Instagram. The ad relies on two strategies. First, celebrities grab people’s attention. Many of the comments on social media are about the icons that the person looks up to. 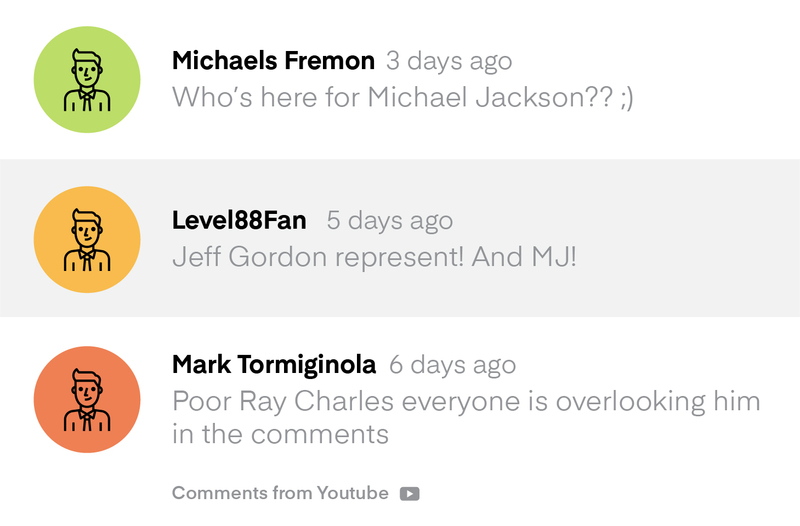 Jeff Gordon, Ray Charles, Michael Jackson. It’s almost absurd how much star power Pepsi managed to pack in. That’s a big draw for many people. But it’s the ad being jam-packed with cultural references that sparked memories in the audience, and prompted their sharing. Nostalgia is a powerful arousing emotion. It can drive people to tears. It’s also a trigger to share. Nostalgia is all about the things which have happened to us and the people we love. Each of these nostalgic reactions also elicits a story. 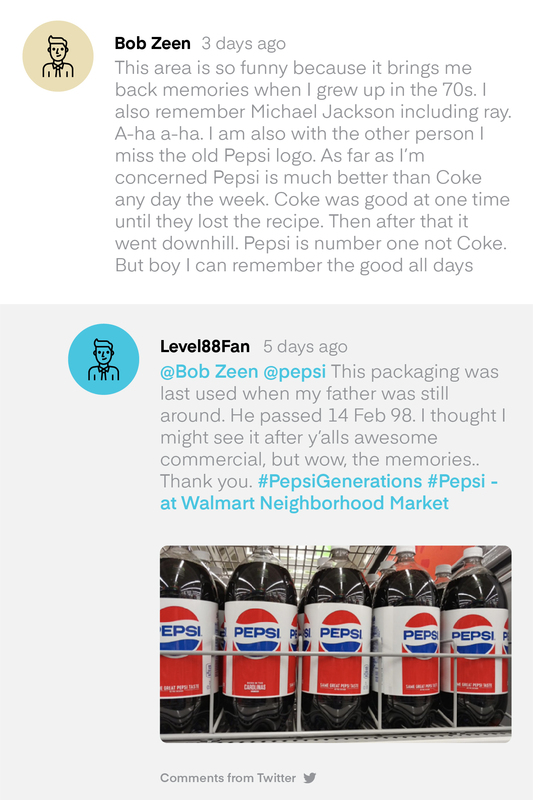 Pepsi Generations will likely go down as one of the best customer-generated marketing campaigns. It’s not the ad that will cement Pepsi in people’s memory and accomplish the goal of “being the choice for decades to come” — it’s the stories about people’s friends and family. Next time they see a Pepsi, that’s what they’ll remember, and that’s what they’ll buy. That’s the key takeaway from this campaign. Marketing leaders don’t need to go out and spend millions to depict Michael Jackson in an ad narrated by Jimmy Fallon. Instead, they use emotion to activate your brand’s champions and get them to tell stories about your product. It’s a powerful strategy that can cement your brand’s position and drive tons of additional revenue. Competitive, confrontational, cool. These are the words that come to mind for the combo Doritos and Mountain Dew ad spot. Again, it’s celebrities that get people engaged in the ad. Missy Elliott, Morgan Freeman, Busta Rhymes — and Peter Dinklage standing in a castle is going to get any “Game of Thrones” fan to unmute the television. But it’s the team dynamic that carries it. People love to pick sides in a team. It’s by definition exclusive, and gives people bragging rights. Wharton School of Business Professor, Jonah Berger say, “Scarcity and exclusivity help products catch on by making them seem more desirable. If something is difficult to obtain, people assume it must be worth the effort.” It’s also a common tactic that you see in marketing for popular books, television, and even children’s stuffed animals. Done well, this type of artificial exclusivity works. According to a different social media tracker, this paired ad spot is actually the most shared across all social media. Marketers building an ad strategy would do well to consider if they can position their brand “against” something else. That can be an external or abstract enemy, but it’s even better if you can position against two sides you both own, like in this commercial. You will get the benefits of engagement and potential for virality without the risk of spending ad dollars talking about a competitor. Tide ran ads every quarter at the Super Bowl, but they didn’t make the cut in the Salesforce study. That’s because Twitter and Instagram wasn’t their target audience. The content was tailored to a different channel. It outperformed every other ad in terms of discussion on the social platform reddit. There were multiple posts with hundreds of thousands of “upvotes” total and millions of additional positive brand impressions. The strategy behind the ad is to take down the other commercials in the Super Bowl by asking people to question if the ad they are watching is a Tide ad. It’s an excellent example of the ad archetype called “Unification”, where the ad references what is physically surrounding it, in this case the ads immediately before and after it. According to Jacob Goldberg and his colleagues in the book “Cracking the Ad Code,” it’s one of the strategies that audiences consistently rank as most creative. The reason why it went viral is that the ad was playing to an audience which is specifically incentivized by gamification. It performed exceptionally well on Reddit specifically because this social network loves irreverent and self-referential content. Gamification amplified the effect — “karma” is awarded to the users who posted these articles which posted well, in a much more visible way than on other social media platforms. Marketing leaders who want to use these tactics for an extra boost in their campaigns can ask two questions. Which part of my ad strategy will resonate most with my audience? Is there something in particular (like irreverence for Reddit) which stands out? What will physically (or digitally in the case of display ads) surround the ad? Can we use that in some way within the creative to emphasize our strategy? Making these tweaks rarely requires a rethink of your entire campaign strategy. They are easy to create and A/B test with little additional effort, and they often prove to be the highest performing in any marketing campaign. Let’s take a step back and appreciate that 3 out of the 4 most viral ads from this year’s Super Bowl were from brands owned by PepsiCo. One of the ads was just poking fun of all the other brands that they own, getting them additional impressions from an audience they might not otherwise reach! Individually, each ad followed some best practices. Tide used gamification and unification, Mountain Dew/Doritos relied on competitiveness, Pepsi had nostalgia. Taken together, each campaign worked as a portfolio to amplify to the effects of the others. Of course, you don’t need to be a powerhouse like PepsiCo to utilize these strategies. Just look at Avocados From Mexico, which found a creative and viral way to advertise a fruit. Work across channels and build multiple touchpoints to further cement your message and drive revenue. Marketing managers should use this as an example of how to create portfolios of marketing campaigns that play off of each other. If your company has multiple product lines being promoted to the same audience or channel, picking key attributes to play off each other can help here. Benefits include getting extra mentions, reaching parts of your audience you couldn’t before, and cementing your brand’s positioning in the marketplace.